Bolt Carrier - Small-Frame - 7075 T6 Aluminum - Anodized - Includes titanium firing pin and JP Enhanced Gas Ring - Weight: 3.76 oz. with key installed - Compatibility and Usage - Non-ferrous specialty carriers should be considered consumable rather than lifetime parts. The JPBC-1 yields a performance advantage for competition applications at a price. Your usage and maintenance will determine the duty life of your carrier. - The JPBC-1 is a competition/race gun part only and is not recommended for any duty/defense use where absolute reliability is required. 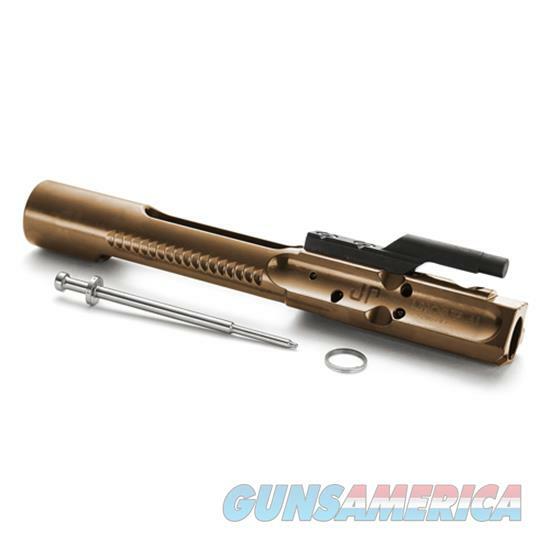 - This carrier should also be run with an adjustable gas system to minimize stress on the entire bolt carrier assembly. - This carrier is not recommended for use with gas systems shorter than mid-length for longest service life. Use with carbine or shorter gas systems may result in gas erosion in the tail stock area and subsequent leakage and reduced service life. - Not for use in .308 AR-type rifles.